Tattoo Blog » Meet John Anderton! 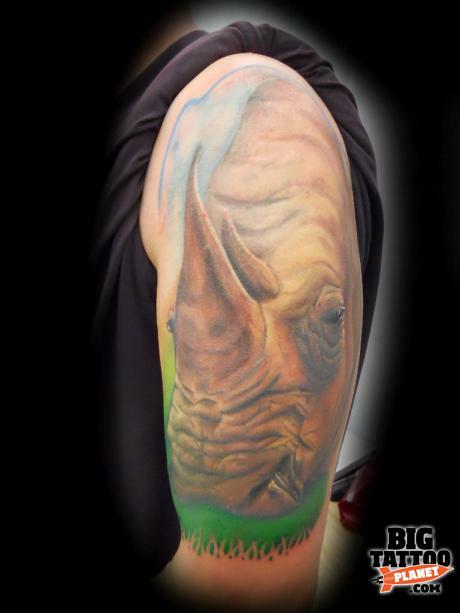 Tattoo Blog » Inspired » Meet John Anderton! I really think that I need to go on a serious road trip throughout England. Aside from it being a beautiful country, it always seems to me that the best tattoo artists from England that I’ve seen don’t all just live in London. Don’t get me wrong, there are many, many, insanely talented tattooists making a living in London, but when you really get down to it and look around, there are just so many superb tattooists living outside of the big city, tucked away in little known places. Fortunately enough, though the places where we find great artists might often be small, the artists themselves certainly aren’t. John Anderton is one of such artists who works in a lesser known area of England. Anderton’s Nemesis Tattoo opened in Seaham, England back in November of 2009. As an artist, Anderton splashes around enough colour, depth, realism – you name it, anything short of straight up magic – and creates portraits and images that are alive with character and intensity. If you’ve never heard of John Anderton before, then all you have to do is look at even one of the tattoos available at his online portfolio. One. After that, anyone who has taste is hooked. Anderton’s tattoos impress me more every time that I look at them. There’s so much detail and such a command over that detail that it’s easy to sort of lose yourself while looking at each piece. First stop on my England road trip is going to be Seaham. One day. Here’s to a long and successful career, John Anderton!